Abstract: The Alexia Kathryn Tsairis Family Papers contains materials related to Alexia Tsairis, one of 35 Syracuse University students killed in the bombing of Pan Am Flight 103 over Lockerbie, Scotland. Collection materials include Alexia's photography, personal effects, and memorabilia from high school and college. Additional materials related to Alexia, her life and legacy can be found in the Alexia Foundation for World Peace and Cultural Understanding Collection. 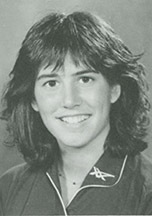 Born July 6, 1968, Alexia Kathryn Tsairis was a junior at Syracuse University's S.I. Newhouse School of Public Communications majoring in photojournalism. She was also an accomplished student athlete, and played for Syracuse University's women's volleyball team. Alexia had spent the fall 1988 semester in London. Her mentor, Professor David Sutherland, recalled she had been selected by both the faculty and her peers as "the most talented and promising photographer in the group" of photojournalism students. By her senior year of college, Alexia had spent two summers working in the Graphic and Photo Departments of the Associated Press. Even before graduation, her promising career was under way. Alexia's bright future was cut short by the December 21, 1988 bombing of Pan Am Flight 103 over Lockerbie, Scotland. She was survived by her parents, Peter and Aphrodite, her brother, George Alex, and sister, Ariadne. Alexia's legacy and passion for photography live on through the Alexia Foundation for World Peace and Cultural Understanding, founded in 1991 by Peter and Aphrodite Tsairis, and David Sutherland. The Alexia Foundation was established with an abiding belief in the responsibility and capability of individuals to shape and advance the cause of peace, and is dedicated to providing the means by which to accomplish this goal. To that end, the Foundation presents annual awards of grants and scholarships to both professional and student photojournalists. To date, over 140 photojournalists have been recognized by the Foundation with funding totaling nearly one-million dollars. More information about the Foundation is available on their website, AlexiaFoundation.org, and in the Alexia Foundation for World Peace and Cultural Understanding Collection here at the Pan Am Flight 103/Lockerbie Air Disaster Archives. Correspondence is divided into two subseries. The Alexia Tsairis subseries contains Alexia's personal incoming and outgoing correspondence from high school and college. The Peter and Aphrodite Tsairis subseries includes the personal correspondence of Alexia's parents with Syracuse University, and the Syracuse University Archives. Memorabilia contains two subseries. The first of these, the Alexia Tsairis subseries, houses items that belonged to Alexia. Included are commemorative pins, her high school graduation cap and tassel, and her Pi Beta Phi Fraternity for Women baseball cap. The Peter and Aphrodite Tsairis subseries contains a protest placard featuring an image of the December 23, 1988 front page of The Daily Mail bearing the headline "Why Weren't They Told?" Memorials includes correspondence, writings, printed materials, and service programs for the funeral and memorial services of Alexia Tsairis. Photographs of Alexia, and her personal photography comprise the bulk of this collection. This series includes prints of many of the photographs taken by Alexia during her semester in London, as well as several examples of photography from her S.I. Newhouse coursework. Also included is a self-portrait, taken shortly before her departure for study abroad. Printed Material includes yearbooks from Alexia's junior high and high schools. Subject Files consists of two subseries. The Alexia Tsairis subseries contains her schoolwork and scrapbooks, as well as personal effects returned from the crash site of Pan Am Flight 103. The Peter and Aphrodite Tsairis subseries contains files related to the return Alexia's personal effects, Peter and Aphrodite's participation in victims' groups, and a visit they made to see Alexia in London during her semester abroad. Alexia Foundation for World Peace and Cultural Understanding. The Alexia Kathryn Tsairis Family Papers were donated by Peter and Aphrodite Tsairis between 2009 and 2015. The Alexia Kathryn Tsairis Family Papers are fully processed. Individual series are arranged in either chronological, or alphabetical order as appropriate. Subseries have been created as necessary.